Disney and Lucasfilm's galaxy far, far away is more popular than ever, thanks to two massive box office hits in as many years, Star Wars: The Force Awakens and Rogue One: A Star Wars Story. There is even a growing number of novels and comic books that fill in certain parts of the Star Wars canon, with seemingly no end to this franchise in sight, which certainly isn't an issue with most die-hard fans. With any franchise as popular as Star Wars, there are always those who try to parody these characters, and while many aren't successful, there are some that could be big hits, such as a new video that surfaced this week which gives R2-D2 a human voice. This video debuted on the Auralnauts YouTube channel, which features a number of iconic scenes from the first Star Wars movie, but instead of Artoo's traditional beeps and whistles, he's been given a real voice, courtesy of British voice actor and impressionist Scheiffer Bates. The voice actor has worked on Robot Chicken, Tinkershrimp & Dutch and has been featured on Jimmy Kimmel Live doing an impersonation of Kit Harington's iconic character Jon Snow. This 13-minute video features Scheiffer Bates poking some fun at R2-D2's longtime robotic companion, C-3PO. The video features Artoo offering some playful jabs at C-3PO regarding his lack of optimism, while other scenes fill in the blanks, such as the scene in A New Hope where Threepio tells Artoo not to call him a "mindless philosopher," while calling him an "overweight glob of grease." This video only features scenes from A New Hope, so it's possible that this could be the start of a whole series with new R2-D2 dialogue, but it isn't clear if there are plans for more videos in the works. Given the popularity of R2-D2 and C-3PO among Star Wars fans, there would likely be a demand for more of these types of videos. Other memorable scenes in this video include R2-D2 being tazed by a couple of Jawas, as we get to see what R2 had to say before being blasted. We also see what R2 says during his pivotal introduction to Luke Skywalker, after the droid displays the message from Princess Leia. This exchange is quite hilarious, with R2 telling Luke that the Princess is "no one," just a passenger on their old ship, and that this message is for his true master, Obi-Wan Kenobi. It certainly does put a new spin on things, hearing what R2-D2 may have actually said, if he had a voice. 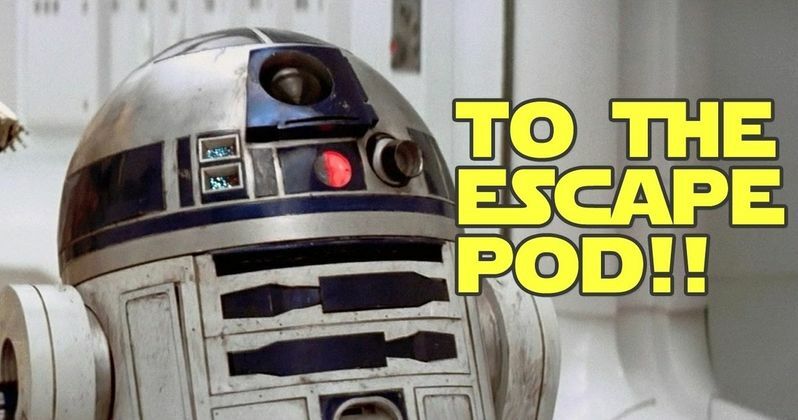 We did see R2-D2 quite briefly in both The Force Awakens and Rogue One: A Star Wars Story, and he's expected to next be seen in Star Wars: The Last Jedi, as he was last seen traveling to Ahch-To with Rey and Chewbacca. With the 40th Anniversary of the Star Wars franchise happening this year, and the celebration kicking off at Star Wars Celebration this April, perhaps we'll learn more about how this beloved droid fits into future movies. Until then, check out this hilarious video that gives R2-D2 a real voice in Star Wars: Episode IV - A New Hope.